The average calculator will calculate the mean of up to thirty numbers. An interesting aspect of the calculator is you can see the change in the mean as more values are entered. 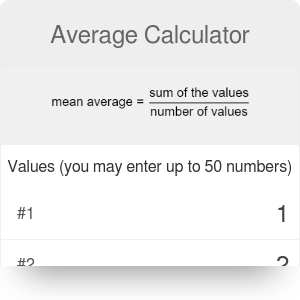 Before we use the calculator, we should know how to calculate the average. Note that the mean is the same as average and can be used interchangeably. The average of a set of numbers is simply the sum of the numbers divided by the total number of values in the set. For example, suppose we want the average of 24,55, 17, 87 and 100. Simply get the sum of the numbers 24 + 55 + 17 + 87 + 100 = 283 and divide by 5to get 56.6. A simple problem as such can be done by hand as well, but more complex numbers involving many decimal places are more conveniently solved using the calculator. Note that the mean rating calculator does a similar math - it calculates an average rating given the number of votes with values from 1 to 5. Multiply the value of the letter grade by the number of credits in the class. Do this for all the classes and take the sum. Divide the sum by the total number of credits. Average Calculator can be embedded on your website to enrich the content you wrote and make it easier for your visitors to understand your message.